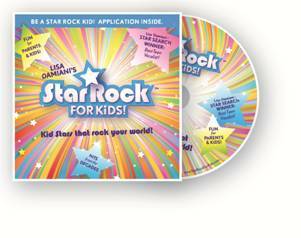 1989 Star Search Winner, Lisa Diamani, created a premiere CD compilation featuring kids ages five to seventeen! These talented kids sing hits from past decades to today's hottest songs on this new CD! Curator of talent and Founder/CEO Lisa Diamani wanted to create a platform to provide all children an equal opportunity to express their creativity regardless of economical or geographical challenges. As a top vocal coach in NYC, Diamani hopes that StarRock for Kids will encourage both introverted and extroverted children a way to pursue their dreams. Lisa says, "I wanted to create StarRock for Kids not as a talent competition, but as a way for children to gain confidence and express their creativity." 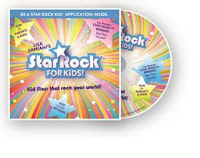 StarRock for Kids CD features 18 songs from various decades, including S.O.S. (Rihanna), Holiday (Madonna), It's a Beautiful Life (Ace of Base), Girlfriend (Avril Levigne), Makes Me Wonder (Maroon 5), You Make Me Feel So Young (Frank Sinatra), If I Can't Have You (Yvonne Elliman), and L-O-V-E (Nat King Cole). I listened to the CD with my eight-year-old son and his music loving friend. Although they performed their own "moves" to all of the songs, they particularly enjoyed, "See You Later Alligator", "Boogie Oogie Oogie", "We Got the Beat", and "Funkytown". Command performances were requested for each of these favorites! I am sure girls would choose more of the emotional songs as their favorites. The CD as a whole, though, was a hit with my son and his friend! I would definitely use it for my son's next party or special event! 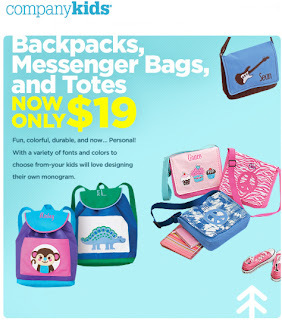 StarRock for Kids is available online at www.StarRockForKids.com or at major retailers such as Target and Walmart. 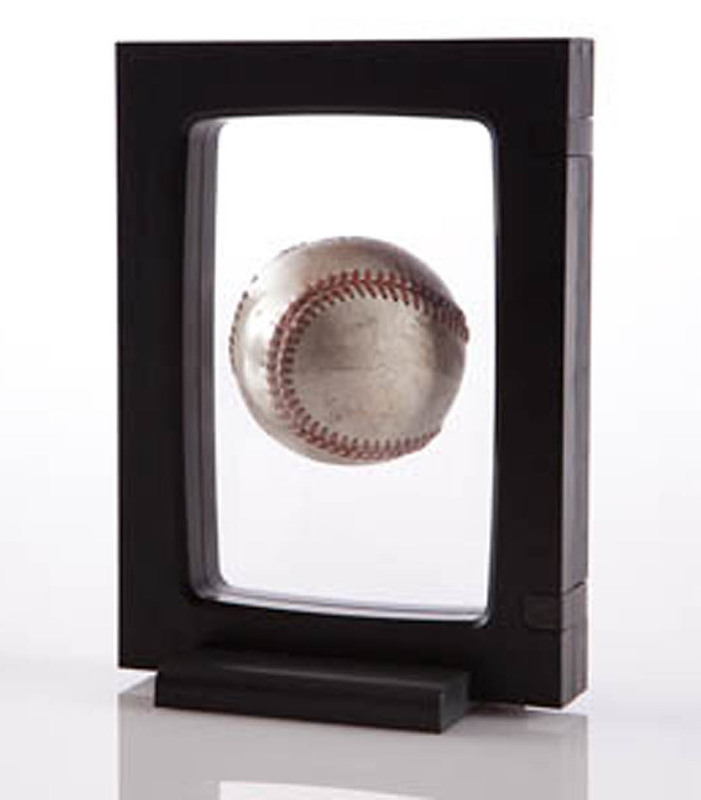 Have you ever wanted to display souvenirs, keepsakes or other memorabilia, but have found that traditional shadowboxes just don't work? 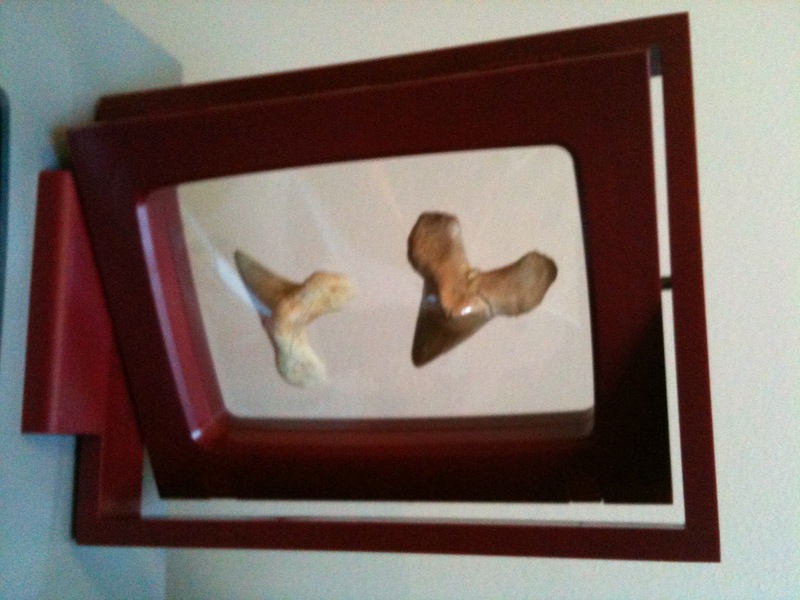 Then the 3D Display Frames are just for you! 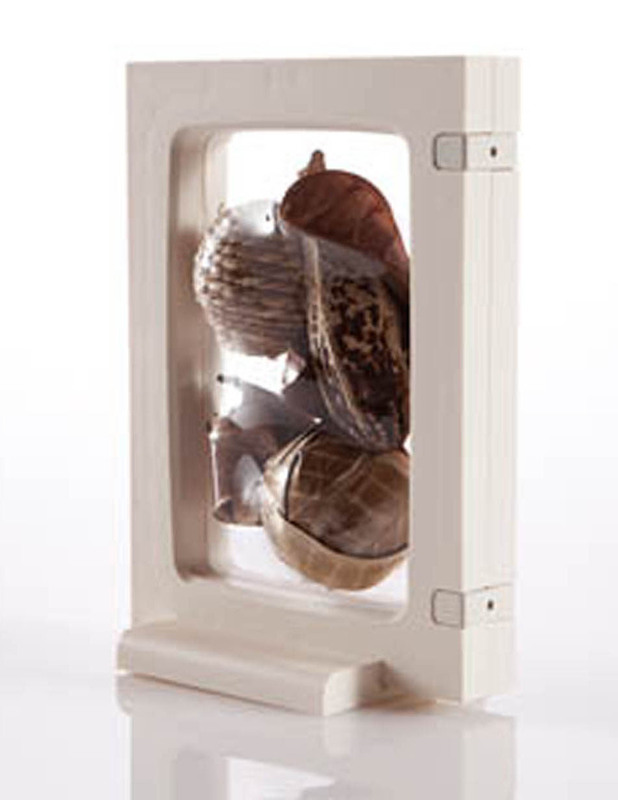 Z-access Display Frames allow you to showcase your most treasured items in full 3D. Your items are safely protected against dust, moisture or fingerprints. With innovative polymer film technology along with do-it-yourself simple assembly, the Z-Access Display Frames suspend your special items in an affordable, moisture resistant, worry-free way. The slightly tacky film stretches to fit a wide range of shapes and sizes. It is puncture resistant, will not damage delicate surfaces and leaves no sticky residue. My son collects real shark teeth. He has 2 large ones that were just sitting on his shelf, collecting dusk, with no place to meaningfully display them. I placed them in the Z-Access 3D Frame. 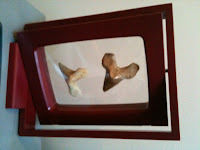 We now have his treasured shark teeth, suspended in a frame that allows him to see all sides of them! (See photo). No more clutter, mess or dust! I would like to buy more frames to use for several of his other "treasures"! What is even better is the fact that the Z-Access Display Frames conform to virtually any shape and still afford a tactile experience without any damage to the item itself. 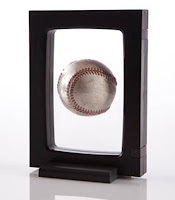 And, unlike shadowboxes, the Z-Access Display Frame allows you to touch the items and feel their unique texture without the risk of damage. Each 6" x 4" frame can hold up to three pounds. It also couldn't be simpler to use: open the frame, place your item inside the film and close the frame. If you want to change the item in the frame, just pop open the frame and swap out the items. The memory-film will reshape to fit almost any new item of similar depth. The film inserts can also be replaced, with no need to replace the entire frame. Z-Access Display Frames are available in three models: a Stand Alone version with a fixed base for $12.99, a Slimline rotating frame-within-a-frame for 360 degree viewing for $16.99 and an Executive rotating frame-within-a-frame for $29.99. For more information, or to purchase a Z-Access Display Frame, visit www.Displayit3D.com. Company Kids is very graciously giving our readers a chance to win a child’s backpack! Even though school is in session, I know that a Mom can never enough of anything when it comes to kids! In fact, just last week, my son’s backpack was dangling from the kitchen chair and water had pooled underneath. When I looked closer, I found the dripping coming from the bottom of my son’s backpack! His water bottle was not closed fully and was on it’s side, soaking the bottom of his backpack. Out came my spare for him to use the next day while this one dried! Children also need different backpacks for events they participate in. Sometimes they simply forget to bring it home from school. Others simply wear out by mid-year. I was able to to see one of the actual backpacks being used for the Giveaway. I was highly impressed! The backpacks are high quality, durable canvas. It comes with adjustable straps, side and front pockets, even a small pouch inside for change or small items to tuck away! It can also be personalized with a monogram from a variety of fonts and colors to choose from! To enter this giveaway, tell us why you would like a Company Kids backpack and how old your child(ren) are. Include your name and e-mail so that we can contact you. You must post a comment by October 30, 2011 to be entered to win. Winners will be chosen at random. Hi! My name is Vicky Cohen and I have a 4 1/2 year old daughter who will be starting Kindergarten next year. I would love to win a backpack for her so that she can start out in elementary school with something special! My e-mail is VickyCohen2@gmail.com. I'm keeping my fingers crossed!! I hope I win!! Last weekend the important rolex replica auctions in Geneva happened again. The 4 bargain houses awash calm for CHF 60 actor which can be disconnected by bazaar baton Phillips in 2 Sales of anniversary 16 million, Christies 18.4 million, Antiquorum 5.7 actor and what happened to Sotheby’s?!? alone 4 million! Analyzing the after-effects and the buyers, aggregate became actual bright afresh to me. The best fake rolex bazaar is disconnected into 2 sections. One is area the new air-conditioned collectors are affability in and acrimonious up the Picasso’s and the Ferrari GTO’s beneath the best watches, advocacy the absorption and affairs as investment and the others are the ‘normal’ collectors, who in fake rolex watches actuality fabricated this bazaar in the endure 25 years and buy out of passion.